Now that the legalities are settled and we all know that WATCHMEN will most certainly be hitting screens come 030609, we can dive into the musical possibilities the film will afford us. And to that end, we have WARNER-REPRISE's official press release below. You can go to the official music site and sign up for updates and order a 12" picture disc (whatever that is)...that also has "Desolation Row" by Chemical Romance and also one cut from Tyler Bates' "Prison Fight." BURBANK, Calif.--(BUSINESS WIRE)--Warner Sunset / Reprise Records will release both the soundtrack and original score to the feature film Watchmen on March 3rd — three days before the March 6th release of the highly anticipated feature film. Music From The Motion Picture Watchmen , the film's official soundtrack, includes My Chemical Romance's powerful reinterpretation of Bob Dylan's "Desolation Row," recorded exclusively for the film. The soundtrack also features a collection of classic songs by such artists as Nat King Cole, Simon & Garfunkel, and Janis Joplin, which, once heard in the context of the film, will never be thought of the same way again. 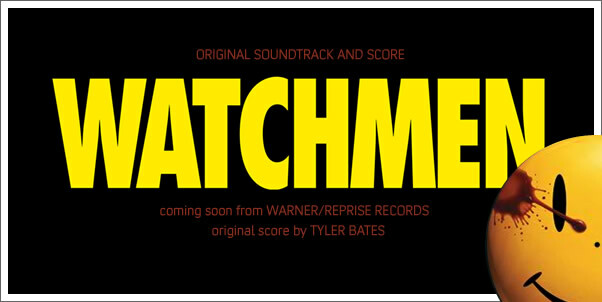 Watchmen Original Motion Picture Score features music by recording artist, composer, and music producer Tyler Bates, who was asked to score the film by Watchmen director Zack Snyder. Tyler, who also scored the Snyder-directed films 300 and Dawn of the Dead, has also scored the soundtracks to The Day the Earth Stood Still, Showtime's Californication, Slither, Rob Zombie's Halloween, and The Devil's Rejects. He is known for his surprising juxtapositions of music styles and flair for delicate, atmospheric touches, as well as stressing emotional vibrancy over traditional formulas of music compositions. Bates has also been chosen to score the Watchmen's DVD added story, "Tales From The Black Freighter." Music From The Motion Picture Watchmen and Watchmen Original Motion Picture Score will be released in multiple fan-friendly configurations: The physical CD, and a digital album will be available on March 3rd, and a vinyl edition of the soundtrack will be released on March 17th. Watchmen Music Collectors Edition 7" Box Set will be released on March 24th. The box set contains 7 double-sided 7" picture discs of each Watchmen character on one side, and images in the likeness of the graphic novel on the other. The Watchmen Music Collectors Edition 7" Box Set will include My Chemical Romance's "Desolation Row," along with 13 tracks by Tyler Bates. A complex, multi-layered mystery adventure, Watchmen is set in an alternate 1985 America in which costumed superheroes are part of the fabric of everyday society, and the "Doomsday Clock" — which charts the USA's tension with the Soviet Union — is moving closer to midnight. When one of his former colleagues is murdered, the washed-up but no less determined masked vigilante Rorschach sets out to uncover a plot to kill and discredit all past and present superheroes. As he reconnects with his former crime-fighting legion — a ragtag group of retired superheroes, only one of whom has true powers — Rorschach glimpses a wide-ranging and disturbing conspiracy with links to their shared past and catastrophic consequences for the future. Their mission is to watch over humanity...but who is watching the Watchmen? Watchmen is directed by Zack Snyder from a screenplay by David Hayter and Alex Tse, based on the graphic novel co-created by Dave Gibbons, published by DC Comics. The film is produced by Lawrence Gordon, Lloyd Levin, and Deborah Snyder. Herbert W. Gains and Thomas Tull are the executive producers, with Wes Coller serving as co-producer. The film stars Malin Akerman, Billy Crudup, Matthew Goode, Carla Gugino, Jackie Earle Haley, Jeffrey Dean Morgan and Patrick Wilson. Warner Bros. Pictures and Paramount Pictures present, in Association with Legendary Pictures, a Lawrence Gordon/Lloyd Levin Production, a Zack Snyder Film, Watchmen. Watchmen will be released nationwide on March 6, 2009. It will be distributed domestically by Warner Bros. Pictures and internationally by Paramount Pictures. * - used in the end credits of the "Tales From The Black Freighter" DVD. 14. Who Murdered Hollis Mason? 15. What About Janie Slater?